* 225 amp 12v engine start helps start stubborn motors. 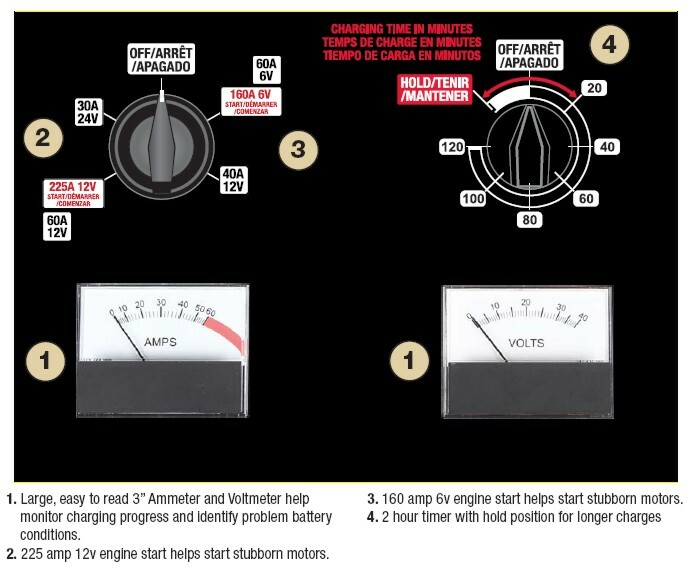 * 160 amp start / 60 amp high 6v charge settings. * 60 amp high / 40 amp medium 12v charge settings. * 30 amp medium 24v charge setting. * Charges 6, 12 & 24 volt maintenance free, conventional wet, deep cycle, AGM, and gel batteries used in cars, trucks, farm equipment, RV, boats and commercial applications. * Charges automotive batteries in 1 to 3 hours. * Large, easy to read 3 Ammeter and Voltmeter help monitor charging progress and identify problem battery conditions. * Two hour timer with hold position. * Heavy duty insulated clamps grip securely on all batteries and safely store on clamp holders. * Heavy duty semi pneumatic wheels and chrome handle. * Six-foot, 6 gauge copper output cables. * 5 year limited warranty on transformer & rectifier, 2 years on unit, and 1 year on cables.